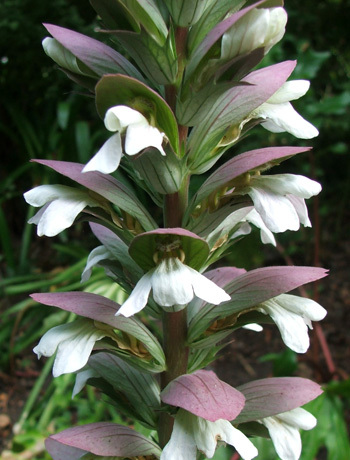 Acanthus are foliage perennials affectionately known as Bear's Breeches - I've stared for long periods of time at my Acanthus patches without ever managing to make the connection. I grow the rich dark green variety of Acanthus in the shade under the old apricot tree. I often miss the flowering time - the tall flowering stems appear in early summer, and the flower spikes are pink, grey and white. They are strange but beautiful. A couple of years ago I bought a light coloured Acanthus variety from a mail order nursery. In its second year I nearly pulled it out by mistake. 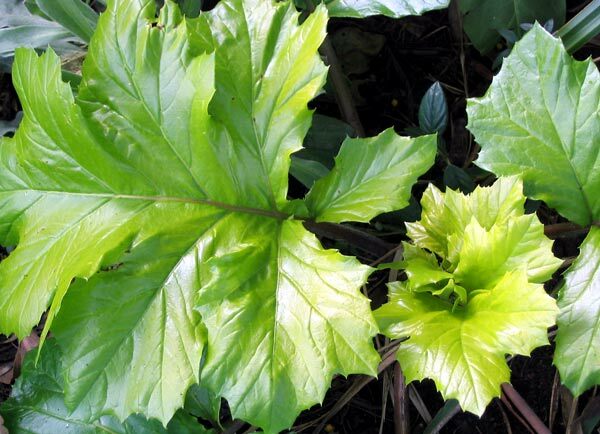 Now this spring the leaves are fully formed, and this Acanthus has become a most beautiful foliage plant. I am waiting for it to seed and spread! Talking of seeding and spreading, the dark green variety is always doing just that! It doesn't worry me, but I'd be careful, though, as to where I'd introduce any new plants. It could become a real nuisance. The light green variety has never flowered for me yet. And the name Bear's Breeches? If anyone can explain this, please let me know!